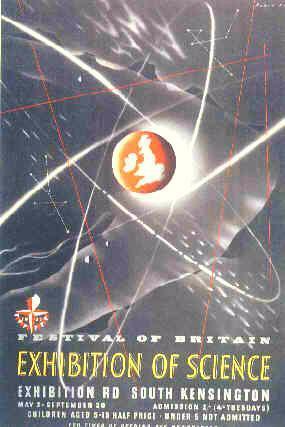 Part of the 1951 FESTIVAL OF BRITAIN, the EXHIBITION OF SCIENCE attempted to be both a clear and a comprehensive exposition of the state, aims, and hopes of post-war science. It was built as a new wing to the Science Museum in South Kensington, but differed considerably in its approach from the museum itself, which was then mostly just a collection of historical steam-engines and other artefacts. Another part of this site is dedicated to the NIMROD Digital Computer that featured in the exhibition. Visit the present-day Science Museum online. Or, on this side of the planet (i.e. California...) drop in to the Exploratorium which is perhaps a descendant of that exhibition fifty years ago (but with a much evolved approach!). • The Science Exhibition attracted nearly 1,500 visitors a day. Over the five months it was open, the total reached 213,744. • The number of operational staff (excluding demonstrators, many of whom were recruited from the student population of the time) was 111.